Note: This page is part of the Peter de Polnay project. I’m starting with the autobiography. Reading de Polnay’s life will enrich, and give context to, his other works that I plan to read. My Road is no.15 in the list of Polnay’s non-fiction work. 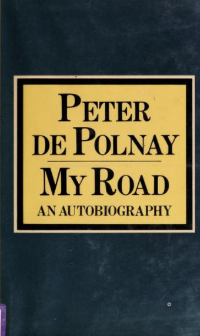 Peter de Polnay wrote the book in 1978. I’ve only just started reading. Updates soon.